AN animal lover whose nose was bitten off and his testicles mauled by two chimps has made an appeal for his missing pet monkey. 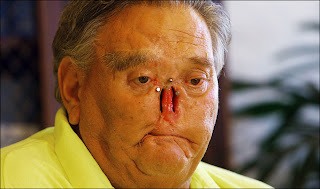 Horrifically disfigured St. James Davis was attacked in 2005 after going to see his house-trained chimp in an animal sanctuary. Two other monkeys escaped their cage and set upon him. The chimps nearly killed Mr Davis, from West Govina, in eastern California, chewing off his nose, testicles and foot. They also bit off chunks of his buttocks and legs before the sanctuary owner shot the animals dead. Now Mr Davis' pet monkey Moe - who had previously bitten a woman's finger off - has vanished after his cage was found empty on Friday. Moe went missing from Californian animal sanctuary Jungle Exotics, where Mr Davis built him a state-of-the-art cage. A weekend search in the San Bernardino National Forest 50 miles east of Los Angeles failed to find Moe. Mr Davis' spokesman Mike McCasland said: "He's a very personable, sweet, nice chimp. "He's not going to be aggressive unless he's provoked." The 42-year-old chimp who has been cared for by Mr Davis and his wife LaDonna for 30 years is toilet-trained and can eat his food with a knife and fork.